Some of the uprisings in the Arab world in 2011 demonstrated the appeal and the power of nonviolent protest. Others, however, bore witness to the enduring appeal of violence, both for embattled regimes and for those trying to unseat them. For the former, violence and the threat of violence promises to restore order and discipline; for the latter it promises direct access to power. It thus becomes in the projection of power both a symbol and an instrument of the seriousness of the political project, expressing resolve and representing the very embodiment of sovereignty: the ability and the right to grant life and death. For government, violence presents itself as a realist resource for stability, the key in fact to ‘stability operations’ – yet one more euphemism to make violence so seductive. For the opposing forces, violence equally is a token of their own seriousness and determination, a graphic way of portraying ‘what the struggle is all about’. Massive and demonstrative violence to inspire terror on the part of established authorities and insurgent forces has therefore been at the heart of many political projects, projecting a realist image, and suggesting that this is something with which you cannot argue. However, the apparent ‘clean break’ of the violent act, the seemingly unanswerable power of violence has severely complicating consequences. Beyond its immediate imaginative appeal, long after the violent act itself, it has a resonance or ripple effect of immense power. It sets in motion social and political processes of enormous complexity and ambiguity that are rarely taken into consideration in so-called realist calculations about the short-term efficacy of violence. There is no final outcome, but a chain of consequences far beyond the control of those who first picked up arms. No better illustration of this exists than lies in the trajectory of violence in Iraq in recent years. It has become associated with certain practices, certain kinds of discipline in a particular historical setting and thus has a ‘logic of deployment’ rich in meaning, symbolism and performative possibility. Thus, violence in Iraq is not, as is sometimes alleged, a throw-back to a cruder, more ‘primitive’ past, driven by dark passions dredged up from history. On the contrary, it has a logic and a constitutive power of its own fully in line with the contemporary experiences that Iraqis have undergone both before and after 2003. Iraqi Army Col. Msfab Yousif reloads his AK-47 after using it to destroy a vehicle that was used in illegal checkpoint activities by insurgents in Ad Dawr near Tikrit; Iraq; November 21.. Demotix/Def Vid. All rights reserved. 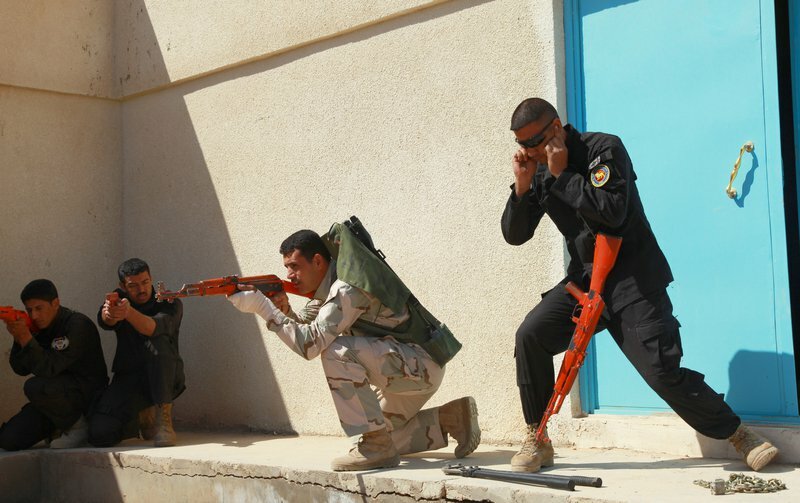 Violence in Iraq has now become a central part of the practice of power, both by the government and by certain non-governmental agencies, some of them bitterly opposed to, but others enmeshed in the webs of government practice. For the government of Iraq under Prime Minister Nouri al-Maliki, the ever unfinished project of re-establishing the power and thus, he hopes, the authority of the central state has often taken a violent form. This has been clear ever since the campaigns in 2008 that saw a reconstituted, if not always very effective, Iraqi army reconquer a number of Iraq’s provinces, with campaigns in the south in Basra, the east of Baghdad, the north in Mosul and the north-east in Diyala. At the time and in the context of the country’s emergence from a bloody civil war, these campaigns were strongly supported by the US and others who saw this precisely as a token of the ‘resolve’ and the ‘seriousness’ of the fragile Iraqi government. The fact that al-Maliki had attached to his personal command perhaps the most effective and ruthless of the units of the reconstituted Iraqi armed forces, the Baghdad Brigade, was believed to assist the state-creating project. Equally, the close and some might say politically unhealthy interest that al-Maliki took in officers’ careers, promotions and transfers within the Iraqi armed forces through his own Office of the Commander in Chief was regarded as merely fitting if he wanted ‘to get the job done’. The problem, as many Iraqis began to discover, lay in what else was coming into being as a consequence. In public, the military presence was meant to symbolise al-Maliki’s grip on power and his capacity to restore order, as his coalition ‘The State of Law’ promised. It was highly visible and clearly aimed at demonstrating both that the withdrawal of the US forces in 2010/2011 would not leave Iraq defenceless, and that the government was in full control. The effect, however, in the words of one Iraqi was that ‘we live as under an army of occupation’. Given the continuing threat of violence from insurgents of one kind and another, this may have been reassuring for some. However, it also seemed to bring with it the idea that any kind of open or public opposition could and should be met with force. Most notoriously, this was evident in the ferocious response in 2011 to any Iraqis who dared to demonstrate during 2011 in the spirit of the ‘Arab Spring’. Thus, whether in Tahrir Square in Baghdad, or in Basra, Mosul or in the Kurdish region in Sulaimaniyya, peaceful protestors were killed, abused and beaten up on the orders of authorities for which violence has become the default response to opposition. In many of these incidents much of the licensed violence against protestors was carried out by apparent ‘civilians’ – that is, men armed with knives and iron bars, and sometimes firearms, who dressed in civilian clothes but could act with impunity, untroubled by the state security forces. This blurring of the line between ‘official’ and ‘unofficial’ violence cannot disguise the fact that both are sanctioned by the Iraqi authorities. Indeed a similar pattern of the franchising of violence seems to be part of a strategy by the prime minister to draw into his own web of patronage some of the most violent militias active in Iraq. Thus, there are reports of negotiations with Kais al-Khazali , leader of the Asa’ib Ahl al-Haq. It had broken with Sadiq al-Sadr’s Jaish al-Mahdi some years ago and, still armed and tenacious, it could be seen as a useful instrument with which to outflank al-Maliki’s nominal ally. The same process appears to have been under way with Hadi al-Amiri and the Badr Brigade, the increasingly independent armed wing of Ammar al-Hakim’s Supreme Islamic Council of Iraq. Here too a nominal ally now finds himself at times up against an armed militia that appears more closely connected to the prime minister’s office than to its former patrons. Nor have these efforts stopped short at the Shi`i militias. There have been efforts to further fragment the nationalist and Salafi/Sunni groups and their own armed forces, with the 1920 Brigades and jihadist organisations often turning their fire on their former allies within the insurgency. Publicly, such efforts have been justified in terms of ‘neutralising’ the violence of all these groupings. However, it could be better interpreted as an effort to redirect their violent potential and to outflank the political and paramilitary forces that confront al-Maliki inside and outside government. The blurring of the line between government sanctioned violence and that which the government apparently tolerates to facilitate its own control of Iraq is paralleled by, and intimately connected with, the use of public office to appropriate public funds for private gain. State assets continue to disappear and those in a position to do so help themselves to state resources as long as they enjoy protection from the government. Yet the prime minister has seen fit to restrict the activities of the Commission on Public Integrity, the very agency that had originally been set up to monitor and prevent such abuses. Indeed, when its members tried to conduct investigations into a number of ministries, they found themselves subjected to real and threatened violence of such a degree that they abandoned the attempt, having tried and failed to enlist the support of the prime minister or even of the police authorities. Added to this are the troubling murders of investigative journalists, such as the late Hadi al-Mahdi, gunned down in September 2011, who dare to expose the levels of official corruption. Violence, it seems, is regarded as a good deal less troubling than public accountability. Nor is this happening only at senior levels of government. Ghaith Abdul-ahad’s chilling piece for The Guardian in January 2012 shows that this has permeated the security and the prison service. There is now a tariff whereby different kinds of threats and violent assaults, including death, can only be avoided through cash payments – even if the judicial branch of the state may have ordered the dropping of charges or the release of particular individuals. Nor is the violence only perpetrated and condoned by the government and its agencies. Indeed, its own methods have been publicly justified by the level of violence still faced by the security forces, by individuals and by significant sectors of the population in Iraq. Despite the sometimes ambiguous relations that exist between the Iraqi government and what can be called ‘NGO’ violence in Iraq, there is no denying the fact that it still faces an insurgency that has been costing some 300-500 lives a month for the past five months. For those contesting the power of the government and challenging its authority, violence has been an equally seductive and attractive option. The direct attacks on government security forces, on government buildings and on officials have been used to signal defiance, rejection of what is regarded as an imposed order and to assert a refusal to be subdued. It has further been used by some groups to challenge the political order emerging in the post-2003 state, characterised variously as sectarian and Shi`i and as drawing support and inspiration externally from the West or from Iran. In this sense, violence has led to the murders of Iraqi Shi`a and Christians who are taken to symbolise this new order. It has also been used instrumentally and as a deterrent to assassinate ‘collaborators’ and to throw into doubt the Iraqi government’s claim to be bringing about a stable, prosperous order in Iraq. Here too, violence is imagined to be a way of realising, or at least of setting in motion, political ends that speak of the ruthlessness, the determination and the realism of those who use it. In this respect, it is often seen as being the most effective way of gaining recognition, of opening a channel of communication with government by speaking a language that those in authority understand only too well. Whether under US occupation or under the present Iraqi government, it has also met with success for its perpetrators, even if the price paid by ordinary Iraqis has been terrible. But the use of violence may be aimed not only at government recognition. 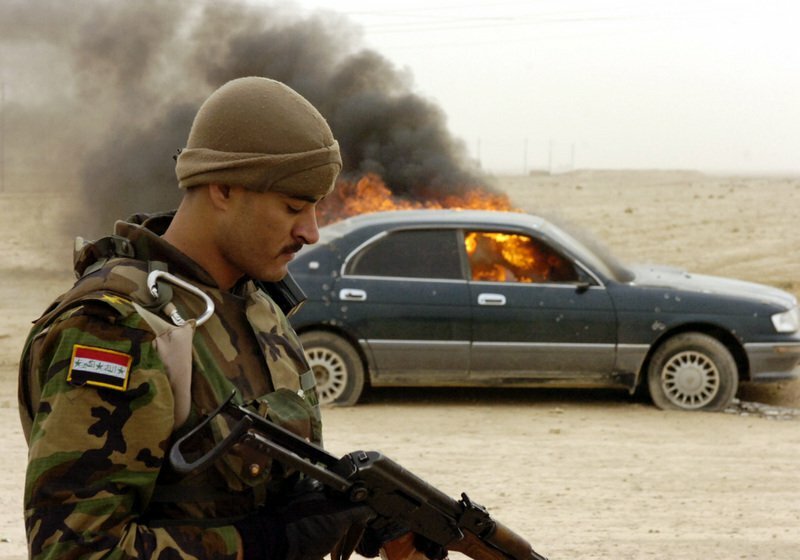 It has also been integral to the flourishing of organised crime in Iraq during the past decades, before and after 2003. The smuggling of commodities, weapons, drugs and people across Iraq’s lightly guarded borders has become a thriving industry, as has the profitability of kidnapping, extortion and hired assassination. Shoot-outs over turf wars between rival gangs and militias, as well as the use of the silencer, the sticky bomb and the car bomb have all been part of this competition for resources in which the token of a group’s staying power and ruthlessness has been its capacity to use violence. The ineffectiveness of the security forces in dealing with much of this may in part be due to lack of capacity, but again it may be due to the intimate connection between networks of criminality and authority, whether at the junior levels of front line enforcement, or at more senior levels of protection and wilful ignorance. Violence in Iraq has thus become integral to the political order. It has been reinforced and locked into the maintenance of that order not simply by the violence of the insurgency, powerful as that may be, but also by the resources it seems to place in the hands of the government. In doing so, its forms, functions and meanings have structural and imaginative effects on the political order and the emerging state. Some of these are open and deliberately visible, such as the punitive military operations, the battles of insurgency and counter-insurgency, as well as the assassinations and bombs in the towns and villages of Iraq. Some effects, however, are less visible, embedded in the coercive force that sustains an order of property and privilege. It guarantees those privileges, as well as the social hierarchies and the narratives that validate them. It is not surprising therefore that it should have been used with impunity by some who enjoy the immunity of powerful protection, whilst being met by devastating counter-violence when practised by the excluded others. In this system it has also become an idiom of opposition – and a token of its seriousness, creating the problem for which the authorities then have to find the solution. Thus violence itself has become a resource, opening doors, underpinning claims to authority and earning money. Much more than that, it has also become a key element in constructing a political order that uses it in lieu of public accountability, a vital force in maintaining both the underlying inequalities and the façade of the parliamentary republic in Iraq.